State Sen. Kyle Loveless (R-Oklahoma City) is the sponsor of SB 838, the Personal Asset Protection Act. Legislation introduced in Oklahoma to require a criminal conviction before property can be forfeited to the government has strong backing from likely voters in the Sooner State, according to a survey released on Thursday. The survey also found strong support for law enforcement in the state. This highlights that support of civil asset forfeiture reform and appreciation for those who protect and survey communities are not mutually exclusive. State Sen. Kyle Loveless (R-Oklahoma City) introduced SB 838, the Personal Asset Protection Act, in May. 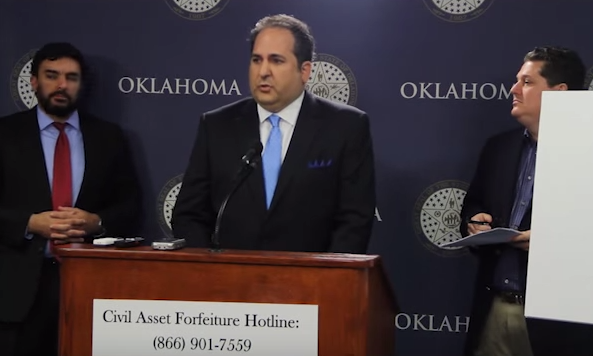 The legislation was filed too late to be considered in the 2015 session, but the hope was that it would start a conversation about Oklahoma's terrible forfeiture laws and a path forward for reform. Not long after SB 838 was introduced, law enforcement officials came out strongly against it and resorted to hyperbolic and vicious attacks against Loveless. FreedomWorks gave Oklahoma a "D-" for its current forfeiture laws. The standard of evidence needed to subject property forfeiture is too low and the burden of proof falls on the property owner, who may never be charged with a crime. Additionally, law enforcement is incentivized to self-fund through forfeiture laws, as they can keep 100 percent of the proceeds. Forfeited funds and property have been misspent or misused by some Oklahoma prosectors. When he introduced SB 838, Loveless explained that Oklahoma's current forfeiture laws contradict basic constitutional protections. "In America, we are proud of our tradition of innocent until proven guilty," he said. "Unfortunately, that’s not the case with civil asset forfeiture. Under current law, the state simply needs to establish a mere suspicion that the property is involved in illegal activity and the owner doesn’t have to be charged with a crime." Oklahomans agree with Loveless, according to the results of a survey released on Thursday by Sooner Poll. Nearly 70 percent of likely Oklahoma voters support legislation to require a criminal conviction before property can be forfeited to the state. This includes 58 percent of self-identified Republicans and 53 percent of self-identified Democrats who "strongly support" such legislation. Another 63 percent said they believe the seizure and forfeiture of property without a conviction is "un-American" because it denies the owner due process rights guaranteed by the Constitution. Though the survey found that over 81 percent of voters have a favorable view of law enforcement, 68 percent believe allowing law enforcement to receive proceeds from forfeited property encourages them to take advantage of the law. Additionally, 57 percent believe that requiring a criminal conviction before seized property can be forfeited would not hurt law enforcement's ability to combat drug crimes. “Oklahomans believe that law enforcement in the state, of which they have a very favorable opinion, is just on the wrong side of this issue," Sooner Poll CEO Bill Shapard said in the release. At a press conference on Thursday, Loveless made clear that SB 838 does nothing to prevent law enforcement from seizing property connected to a crime, though a criminal conviction would be required before it can be forfeited, and simply would protect innocent people whose property may be wrongly taken. "Oklahomans have a clear understanding of the proper role of government; and forfeiting property without convicting a citizen of a crime does not fit into that role," Loveless said of the survey results in a release. "Oklahomans support law enforcement, but they also support the ideals of our constitution. District Attorneys and the courts must protect citizen’s property rights equally with life and liberty -- it’s the American way." SB 838 is grounded in constitutional principles. It protects the right to due process by reversing this pernicious form of government overreach. Certainly, Oklahomans overwhemingly respect law enforcement, but the vast majority of them also want their liberties protected. The opposition to SB 838 is simply unfounded. Oklahoma can still support law enforcement while backing reasonable proposals like SB 838 that will protect due process rights guaranteed in the Constitution. The DEA has been doing this for years. The people need to be protected. Innocent until proven guilty, taking their property before legal trial is violating the constitution. . The United States Government seized more from private citizens than burglars in 2014. Current federal laws regarding civil asset forfeiture are overstepping private property rights under the Fifth Amendment of the US Constitution. Under the Fifth Amendment it is the obligation of government to provide evidence against private individuals whereas current civil asset forfeiture laws require private citizens to prove innocence. Civil Asset Forfeiture, where government confiscation is acceptable if it’s in the name of protecting the United States against drug lords by taking away private property.